The Moulin OPR records that Duncan Seaton was born at Loinconlach of Glengirnaig in 1760. May 11th. Baptised, Duncan to Duncan Seatton and Margaret Robertson in Conlach. There does not seem to be a marriage entry for Duncan Seatton and Margaret Robertson in any of the Perthshire OPRs. This is unusual, but there is evidence that the family could have been Episcopalian and did not worship at the parish church. Duncan's son Duncan was still farming at Conlach when his first son was born 22nd November 1789, so the Elspeth Setton in Conlach who married David Stewart in Levadge, 11th January 1785, appears to be the sister of the younger Duncan. Duncan 11 May 1760 Girsael Robertson 3 Jan 1789 Ceannamoin h.
The Moulin OPR for 3rd January 1789 records that "Duncan Seton in this parish and Girsael Robertson of the parish of Blair Athol were married. To claim that this was the same Duncan Seaton would be speculative if were not for the Blair Atholl OPR which is a little bit more informative. Duncan Setton in Loinconlach, Moulin parish, and Grissel Robertson in Cairnbaddie (married). The spelling of the name of Duncan's wife is quite variable: Girsael; Grissel; Grizel; Girsel; and of course the anglecized version - Grace. One would expect her to marry in her twenties, so she might be the daughter of John Robertson and Janet Campbell, born at Cairnbaddie, 10th January 1765. It is known from his son's death certificate that Duncan Seaton was a farmer at Loinconlach where his second child, Alexander, was born. 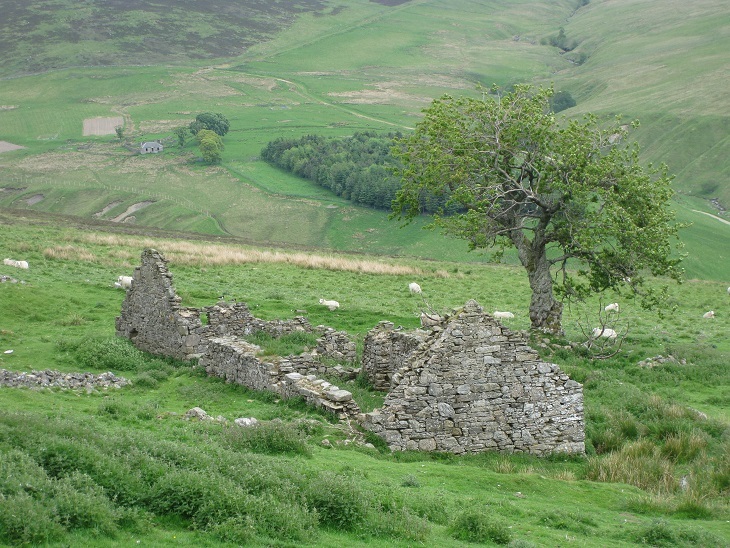 However, the ground there is poor and only fit for raising sheep, so it is not surprising that soon afterwards the family moved over the hill to Ceannamoin in Blair Atholl parish. The ground at Ceannamoin is much flatter and more productive, and this is where the rest of the children were born. 2w. Catharine McLauchlan 1w. 1819? Donald Seaton was born at Loinconlach, before the family moved to Ceannamoin in Glen Fender. Donald, (son) to Duncan Seton in Conlach and Girsael Robertson his spouse (baptised). Apparently he did not marry and nothing is known about him until 1841 when he was living, with his sister Christian, at Donavuilt of Clune (Tonavuilt). This was a very small settlement beside the Allt Cluain stream. He may have been living here for some time as his brother, John Seaton in Donavuilt, married Elizabeth Seaton from Fonvuick in November 1831. Very little of Donavuilt exists today except stones from the original footings. In the early 1800s the land which used to be part of Donavuilt was divided between the adjacent farms and, after that, the settlement was used by agricultural labourers and artisans. Even so, in the 1841 census there were three houses being occupied. Although a Donald Seaton and Christian Seaton appear in the 1851 census at Bridge of Tilt, these are from a different family and there is no further trace of Donald. Alexander Seaton appears to have married Margaret Moon before 1820 but there is no marriage recorded in any of the OPRs. The couple had one child, born in Moulin parish. Margaret Moon appears to be the daughter of Donald Moon and Cicel Setton in Orchil-more, who had been born at Wester Balrobie, 15th December 1797. Donald, (son) to Alexander Seaton and Margaret Moon his wife in Balchurich (baptised). 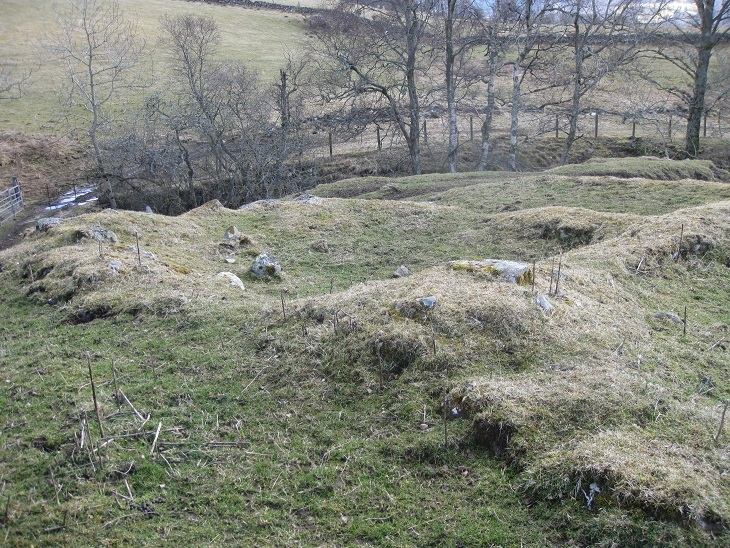 The place seems to be Balchroic which was just to the west of Aldclune, beside the Killiecrankie battle-site. The couple and son also appear in a census of parishioners carried out by the Minister of Moulin over a five year period from December 1820. He recorded them living at Balknock which was listed between Aldclune and West Mains of Urrard in his census. Christian Moon and Alexander's aunt Elspeth Seaton (widow Stewart) were also living at this address. John Stewart and Christian Moon were married 6th April 1807 (Moulin OPR). It is possible that Margaret Moon and Christian Moon were cousins as the surname of Moon is uncommon. They were not sisters as Margaret's sister Christian married Alexander Logie in Little Dunkeld, 2nd December 1826. This Christian Moon, spouse to John Stewart, was the daughter of John Moon and Christian McIntosh. Margaret Moon died at some point before 1826 when Alexander Seaton married his second wife. Alexander Seaton in Mains of Orchil, Moulin parish, and Catharine MacLauchlan in Clune-beg, married. As Alexander Seaton was a tailor it was not too difficult to move from one dwelling house to another, and when their first son was born the family were back at Balchurich (Balchroic). There were nine children in total and all of the others were born at Orchil-more except James, the last child, who was born at Lagnabuig. Perhaps Alexander was not a very good tailor as he is given as a mason in the 1841 Census for Orchil-more. The location of the family by 1851 has not been established, but by the time of the 1861 census they were living at Croftlia in Logierait parish. William McNaughton was born at Torvuick, parish of Moulin, 3rd September 1855. He was the son of Thomas McNaughton, 33 year old farmer born at Toberndonich, and 24 year old Ann McLauchlane born in Glen Fincastle. They were married in Moulin in 1853 and already had a living daughter. Alexander Seaton, tailor married to Catharine McLauchlan died at Croftlea, Logierait parish, 5 Mar 1865 aged 70 years. Parents given as Duncan Seaton, farmer, and Grace Robertson, both deceased. Informant was his daughter Catharine Seaton. Catharine McLauchlan was living in Cargill in 1881. Catherine Seaton, widow of Alexander Seaton, labourer, died at Damhead, Cargill, on 5th January 1893. Parents given as John McLachlan, farmer, and Leah Ferguson, both deceased. The informant was her son Alexander Seaton, who was present. Margaret 13 Jun 1830 . . Cargill d.
Grace 9 Aug 1832 ... Stewart . Dundee d.
John 1 May 1834 . . . d.
Christian 10 Jun 1836 . . . d.
Jean 25 Mar 1841 . . . d.
James 14 Jun 1846 . . . d.
Donald Seaton and Elizabeth Robertson were married in 1843 and the marriage banns were recorded in the OPRs of both Moulin and Dull. Donald Seaton in this parish and Elisabeth Robertson in the parish of Dull - married 21st current. Donald Seaton in the parish of Moulin and Elizabeth Robertson in this parish gave up their names to be proclaimed in order to marriage. In some ways these entries are strange as Elizabeth Robertson was not given that fore-name when baptised. Louisa, daughter to James Robertson and Christian Stewart in Fiarmore (Fiermore) was baptised. Whatever the reason, her name appears as both Louisa and Elisabeth in various documents throughout her life. The couple's first child, Christian, was born in Blair Atholl parish around 1845, but the baptism is not recorded in the Blair Atholl OPR. Christian is listed with the family in the 1851 census, but not the 1861 census, and Donald Seaton claimed to have only 5 children alive in 1855, so she must have died in infancy. By 1847 Donald had taken his family south to the City of Perth in search of work, and the next three children: Margaret; James; and Jean (Jane) were born there. In 1851 the family were living at Low Street in Perth, which was a narrow lane off the Dunkeld road, just to the north of St Ninian's Cathedral. Their daughter Margaret is absent from the family group as she was staying with maternal grandparents in Fiermore. Shortly afterwards Donald Seaton and his family moved to Edinburgh and were in South Leith by February 1853 when their son Alexander was born. Louisa Seaton was born 13th April 1855 at 8 Giles Street, Leith. Parents given as Donald Seaton, railway labourer, 35 years old, born in Blair Atholl and Louisa Robertson, 36 years old and born in the parish of Dull. Louisa was her 6th child, having 2 boys and 3 girls (sic), all still alive. Louisa Seaton died of whooping cough in 1858 when she was only 3 years old and was buried in the Newington Necropolis. The 1861 census for Trinity College, Edinburgh shows the family living at Carrubber's Close, High Street. James ~1849 . . . d.
Alexander 6 Feb 1853 . . . d.
(Tine Macbeth) . Glasgow h.
After the death of his first wife, Donald Seaton married Jessie Wylie in 1867. Donald was working as a railway porter and so was Jessie Wylie's brother Daniel. On 2nd July 1867 at 32 Gilmore Place in Edinburgh, Donald Seaton, railway porter and widower aged 47 years, living at 36 Grassmarket married Jessie Wylie, machinist and spinster aged 36 years, living at 22 William Street. His parents were given as Alexander Seaton, tailor, and Margaret Moon, both deceased. Her parents were given as John Wyllie, keeper of lunatic assylum, and Christina Munday?? ?, both deceased. The couple's first two children, Donald and Robert, were born at the White Hart Inn in the Grassmarket, Edinburgh (Greyfriars parish). The 1871 census return for St. Giles in Edinburgh shows his two sons by his second wife, Donald Wylie Seaton and Robert Wylie Seaton. It also shows a Margaret Seaton (his daughter from the first marriage) and a grand-daughter Jessie R. Seaton (Jessie R. Ferguson). By 1881 Donald and his family had moved to Easter Rhynd House. Donald Seaton, poulterer, died 2nd November 1883 at Old Manse, Rhynd, aged 60 years. His parents were given as Alexander Seaton, farm servant, and Margaret Moon, both deceased. The informant was his son Donald Seaton. Donald and Robert were about 14 and 12 years old when their father died, so they work on fishing boats and farms to help the family. Robert moved to Glasgow and earned his blacksmith journeyman license. In 1901, his mother Jessie Wylie was living with him. Robert married Elizabeth Denny from Paisley in 1905 They and their children emigrated to Ontario, Canada in the summer of 1914. Robert Seaton then found work as a blacksmith in Flint, Michigan, at the Buick Motor Plant. Robert Wylie 23 Feb 1871 Elizabeth Denny 1905 Michigan h.
Donald Wylie . Jessie McLaren . Michigan h.
On the 11th June 1869 Alexander Seaton, ploughman at Hillfoot of Kettins aged 26 years, married Isabella Turpie, maid servant at Higham, Dunbog in Fife, aged 19 years. Witnessed by Alexander Clark and Margaret Seaton. His parents were given as Alexander Seaton, deceased labourer, and Catherine McLachlan. Her parents were David Turpie, farm servant, and Janet Rhynd. By the time of the 1881 census the family were living at Newmiln, Cargill. Christian Seaton was living at Donavuilt with her brother, Donald Seaton the weaver, in 1841. It is assumed that he died as, in the the 1851 census, Christian was living alone at Clune-more, close to Donavuilt. Christian Seaton probably died between 1851 and 1855 as she does not appear in the 1861 census and there is no post-1855 death certificate. John Seaton was living at Donavuilt with his brother and sisters before he married. John Seaton in Donavuilt and Elizabeth Seaton in Fonvuick, married. Elizabeth (Betsy) Seaton was the daughter of Duncan Seaton and Margaret Cameron. Although her father originally came from Balrobie, her parents had lived at Rinancoillach before moving to Fonvuick, but Margaret's birth and baptism are not recorded in the Blair Atholl OPR for either place. As she was 93 years old when she died in 1897, she must have been born at Fonvuick. The 1841 Census for Fonvuick shows a number of families, many of whom were related by marriage. The designations of 'junior' and 'senior' for the two John Setons merely indicate that one was older than the other. Margaret Cameron, of independent means, was the mother of Betty (Elizabeth/Betsy) Seton. Mary Saunders was Betty's niece Mary Colville Saunders, the daughter of John Saunders and Margaret Seaton, born Blairgowrie, 25th January 1835. John Seton, senior, was the older brother of Elizabeth (Betsy) Seton, the wife of John Seton, junior. The Blair Atholl OPR shows that John Seaton, senior, in Fonvuick and Christian Seaton in Ardtulichan married 16th December 1827. However they did not have their children's names entered in the register of baptisms. John Robertson's wife was Elizabeth (Elspeth) Seaton who was living at Balnald of Fincastle when they married in 1796. John Robertson and Elizabeth Seaton were the parents of Isabella, the wife of John Seaton in Ardtulichan, and 12 year old John Seton was their son. Grace Seaton was the sister of James Seaton and Peter Seaton who moved to Ardtulichan from Coille Bhrochain. By the time of the 1851 census there were fewer Seatons at Fonvuick. The 1871 census shows John Seaton for the last time. John Seaton, farm servant married to Betsy Seaton, died at Fonvuick 28th June 1879 aged 79 years. Parents given as Duncan Seaton, deceased farmer, and Grace Robertson, deceased. Informant was his son James Seaton. Elizabeth Seaton, widow of John Seaton, crofter, died at Fonvuick on 20th January 1897 aged 93 years. Parents given as Duncan Seaton, crofter, and Margaret Cameron, both deceased. The informant was her son James Seaton, who was living in Foss. Duncan 20 Aug 1832 Ann McDonald 1856 Little Dunkeld h.